After making sure I had AAAA records for my nameservers too, I used the checker at ready.chair6.net to see what it thought of my IPv6 setup. (The bit about the MX record actually came slightly later when I looked at setting up Postfix to use IPv6). To fix this I have submitted a support ticket to my domain registrar to ask them to add IPv6 glue records for the domain I use to operate the nameservers (sadly their web interface doesn’t let me do this automatically). The only other thing remaining was to allow my master DNS server to sync to my slave over IPv6 as well as IPv4. That was a case of updating /etc/bind/named.conf.local on the master to add the IPv6 address of the slave into the allow-transfer and auto-notify sections, and edit the same file on the slave to add the IPv6 address of the master into the masters section, then restart bind on both servers. 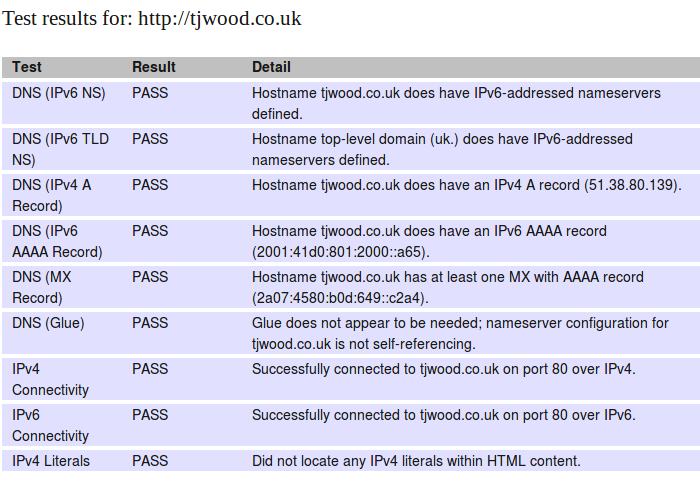 The logs show that it actually now syncs over both IPv4 and IPv6, which isn’t really an issue.